Smaato’s global monetization platform delivers up to 10 billion ad impressions per day auctioned through a network of over 450 partners. 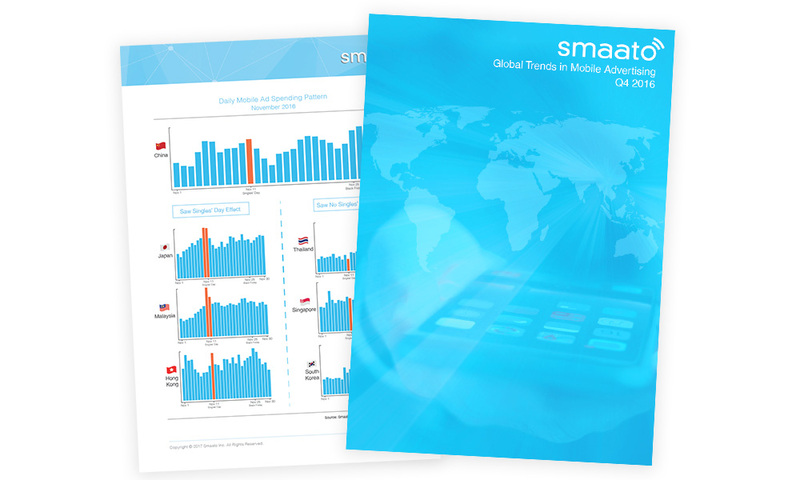 After analyzing massive amounts of data from our platform in 2016, including Q4 2016, we highlight five key insights into mobile programmatic advertising worldwide in Smaato’s Q4 2016 Global Trends in Mobile Advertising report. Mobile advertising spending – both globally and regionally – experienced robust growth in 2016 versus 2015, with China seeing the highest growth. Not only did advertising spending continue shifting from mobile web to in-app, but in-app now dominates, as advertisers are taking note of the unique capabilities of the in-app environment. Mobile video ad spending skyrocketed in Q4 and almost tripled in one quarter alone. What day of the week generates the most global mobile ad spending? Is it the same day of the week by country in the biggest mobile ad spending markets? Download our latest report to find out. Special “Shopping Event” days drove mobile ad spending during the Q4 2016 holiday period. Take a look at specific trends in key countries for this important time of year.